These seminars aimed to strengthen the new National Anti-Corruption System (SNA) by sharing international expertise. The second seminar on on "Best International Practices on Complainant Protection Systems to Develop an Implementation Strategy for Mexico" was held in January 2017 . 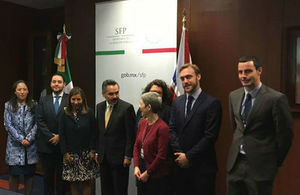 The first seminar was held in September 2016, with the participation of Javier Vargas Zempoaltecatl, Undersecretary of Administrative Responsibilities and Public Procurement and in charge of the Office of the Ministry of Public Function (SFP, in Spanish); as well as Olivier Evans, Deputy Head of Mission and Political Counsellor at the British Embassy in Mexico and Dominic Le Moignan, Director of GovRisk. The second seminar was held in January 2017 with Unit holders, Directors and Directors General of the areas involved in these issues. The British Embassy’s Prosperity Fund, which seeks to promote economic growth and development in Mexico, funded this project. This is a demonstration of the British commitment to invest in the future of Mexico and strengthen relations between both countries.